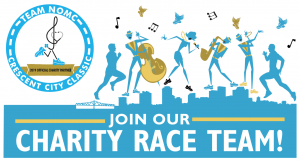 Run/Walk/Jog/Second Line the Crescent City Classic as a member of Team NOMC. Support the USA’s only comprehensive medical clinic for musicians, artists and culture makers. Help us reach our goal by raising a minimum of $250. – Top fundraiser earns a 2 night stay at Ace Hotel New Orleans + $100 gift card to Josephine Estelle ! Join Team NOMC on Facebook for updates, promos and more. Share your photos and use the hashtag #TEAMNOMC ! Follow these easy steps to become a Team NOMC Member! 2. Select REGISTRANT #1 to sign yourself up and fill in all fields. 5. Read and agree to Waiver and Terms. 6. Fill in ALL fields. Tips: The T-Shirt is unisex sizing. Average expected completion times for a 10K are 1:45-2:00 for walkers; 1:20-1:30 for joggers; 1:00-1:15 for runners. 7. Choose ORANGE for the Charity Corral and enter an emergency contact. 8. Set up your Fundraiser Page! Tips: Include your fundraising goal, personalize a message and add a photo. You can kick off your fundraising by donating a small amount before you share with folks! race festival in City Park for family or friends. If you do not wish to do so, click continue. 10. Review all information and submit payment for $40 registration fee. Note: If you sign up multiple people at once, you can only enter one credit card. For questions or additional info email Stacey at programs@nomaf.org. April 20th – Race Day! *Team Members are required to pick up Race Bibs at the CCC Expo.